Moscow, February 1953. A week before Stalin’s death, his final pogrom, “one that will forever rid the motherland of the vermin,” is in full swing. Three government goons arrive in the middle of the night to arrest Solomon Shimonovich Levinson, an actor from the defunct State Jewish Theater. But Levinson, though an old man, is a veteran of past wars, and his shocking response to the intruders sets in motion a series of events both zany and deadly as he proceeds to assemble a ragtag group to help him enact a mad-brilliant plot: the assassination of a tyrant. While the setting is Soviet Russia, the backdrop is Shakespeare, with Stalin in the role of mad king. 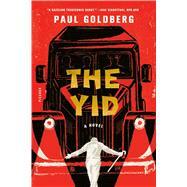 As hilarious as it is moving, as philosophical as it is violent, with echoes of Inglourious Basterds and Seven Samurai, The Yid is a tragicomic masterpiece of historical fiction.